Italian East Africa (Italian: Africa Orientale Italiana) was an Italian colony in the Horn of Africa. It was formed in 1936 through the merger of Italian Somaliland, Italian Eritrea, and the newly occupied Ethiopian Empire which became Italian Ethiopia. "We are bound by Treaty and by Religion"
"Royal March of Ordinance "
Italian East Africa in 1936. Italian East Africa was divided into six governorates. Eritrea and Somalia, Italian possessions since 1869 and 1889 respectively, became Eritrea Governorate and Somalia Governorate, while Ethiopia was made of Harrar, Galla-Sidamo, Amhara, and Scioa Governorate. When established in 1936, Italian East Africa (the other Italian colony in Africa being Italian North Africa) consisted of the old Italian possessions in the Horn of Africa, Italian Eritrea and Italian Somaliland, and the recently annexed Empire of Ethiopia. Victor Emmanuel III of Italy consequently adopted the title of "Emperor of Ethiopia", although having not been recognized by any country other than Nazi Germany and Imperial Japan. 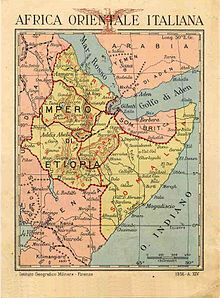 The territory was divided into the six governorates of Italian East Africa: Italian Eritrea and Italian Somaliland, plus four provinces of Ethiopia (Amhara, Galla-Sidamo, Scioa, Harar) each under the authority of an Italian governor, answerable to a viceroy, who in turn represented the Emperor. Italian East Africa was briefly enlarged in 1940, as Italian forces conquered British Somaliland, thereby bringing all Somali territories under Italian administration. However, the enlarged colony was dismembered only a year later, when in the course of the East African Campaign the colony was occupied by British forces. Italian East Africa, in Italian "Africa Orientale Italiana", was acronymed in official documents as "AOI". The dominion was formed in 1936, after the Second Italo-Abyssinian War that resulted in the annexation of the Ethiopian Empire by Fascist Italy, by merging the pre-existing colonies of Italian Somaliland and Italian Eritrea with the newly conquered territory. Historians are still divided about the reasons for the Italian attack on Ethiopia in 1935. Some Italian historians such as Franco Catalano and Giorgio Rochat argue that the invasion was an act of social imperialism, contending that the Great Depression had badly damaged Mussolini's prestige, and that he needed a foreign war to distract public opinion. Other historians such as Pietro Pastorelli have argued that the invasion was launched as part of an expansionist program to make Italy the main power in the Red Sea area and the Middle East. A middle way interpretation was offered by the American historian MacGregor Knox, who argued that the war was started for both foreign and domestic reasons, being both a part of Mussolini's long-range expansionist plans and intended to give Mussolini a foreign policy triumph that would allow him to push the Fascist system in a more radical direction at home. Unlike forty years earlier, Italy's forces were far superior to the Abyssinian forces, especially in air power, and they were soon victorious. Emperor Haile Selassie was forced to flee the country, with Italian forces entering the capital city, Addis Ababa, to proclaim an empire by May 1936, making Ethiopia part of Italian East Africa. Some Ethiopians welcomed the Italians and collaborated with them in the government of the newly created Italian Empire, like Ras Sejum Mangascià, Ras Ghetacciù Abaté and Ras Kebbedé Guebret. In 1937 the friendship of Sejum Mangascia with the Italian Viceroy Prince Amedeo, Duke of Aosta enabled this Ras to play an influential role in securing the release of 3,000 Ethiopian POWs being held in Italian Somaliland. The Italian victory in the war coincided with the zenith of the international popularity of dictator Benito Mussolini's Fascist regime, during which colonialist leaders praised Mussolini for his actions. Mussolini's international popularity decreased as he endorsed the annexation of Austria by Nazi Germany, beginning a political tilt toward Germany that eventually led to the downfall of Mussolini and the Fascist regime in Italy in World War II. East Africa Campaign northern front: Allied advances in 1941. Hostilities began on 13 June 1940, with an Italian air raid on the base of 1 Squadron Southern Rhodesian Air Force (237 (Rhodesia) Squadron RAF) at Wajir in the East Africa Protectorate (Kenya). In August 1940, the protectorate of British Somaliland was occupied by Italian forces and absorbed into Italian East Africa. This occupation lasted around six months. By early 1941, Italian forces had been largely pushed back from Kenya and Sudan. On 6 April 1941, Addis Ababa was occupied by the 11th (African) Division, which received the surrender of the city. :421-422 The remnants of the Italian forces in the AOI surrendered after the Battle of Gondar in November 1941, except for groups that fought an Italian guerrilla war in Ethiopia against the British until the Armistice of Cassibile (3 September 1943) ended hostilities between Italy and the Allies. In January 1942, with the final official surrender of the Italians, the British, under American pressure, signed an interim Anglo-Ethiopian Agreement with Selassie, acknowledging Ethiopian sovereignty. Makonnen Endelkachew was named as Prime Minister and on 19 December 1944, the final Anglo-Ethiopian Agreement was signed. In the peace treaty of February 1947, Italy officially renounced sovereignty over its African colonies. Eritrea was placed under British military administration for the duration, and in 1950, it became part of Ethiopia. After 1945, Britain controlled both Somalilands, as protectorates. In November 1949, during the Potsdam Conference, the United Nations granted Italy trusteeship of Italian Somaliland under close supervision, on condition that Somalia achieve independence within ten years. British Somaliland became independent on 26 June 1960 as the State of Somaliland, the Trust Territory of Somalia (ex-Italian Somaliland) became independent on 1 July 1960 and the territories united as the Somali Republic. The colony was administered by a Viceroy of Ethiopia and Governor General of Italian East Africa, appointed by the Italian monarch. The dominion was further divided for administrative purposes into six Governorates and forty Commissionerships. Fascist colonial policy in Italian East Africa had a divide and conquer characteristic. The Italians invested substantively in Ethiopian infrastructure development. They created the "imperial road" between Addis Abeba and Massaua, the Addis Abeba - Mogadishu and the Addis Abeba - Assab. 900 km of railways were reconstructed or initiated (like the railway between Addis Abeba and Assab), dams and hydroelectric plants were built, and many public and private companies were established in the underdeveloped country. The most important were: "Compagnie per il cotone d'Etiopia" (Cotton industry); "Cementerie d'Etiopia" (Cement industry); "Compagnia etiopica mineraria" (Minerals industry); "Imprese elettriche d'Etiopia" (Electricity industry); "Compagnia etiopica degli esplosivi" (Armament industry); "Trasporti automobilistici (Citao)" (Mechanic & Transport industry). Italians even created new airports and in 1936 started the worldwide famous Linea dell'Impero, a flight connecting Addis Abeba to Rome. The line was opened after the Italian conquest of Ethiopia and was followed by the first air links with the Italian colonies in Africa Orientale Italiana (Italian East Africa), which began in a pioneering way since 1934. The route was enlarged to 6,379 km and initially joined Rome with Addis Ababa via Syracuse, Benghazi, Cairo, Wadi Halfa, Khartoum, Kassala, Asmara, Dire Dawa. There was a change of aircraft in Benghazi (or sometimes in Tripoli). The route was carried out in three and a half days of daytime flight and the frequency was four flights per week in both directions. Later from Addis Ababa there were three flights a week that continued to Mogadishu, capital of Italian Somalia. The most important railway line in the African colonies of the Kingdom of Italy, the Djibouti-Addis Ababa long 784 km, was acquired following the conquest of the Ethiopian Empire by the Italians in 1936. 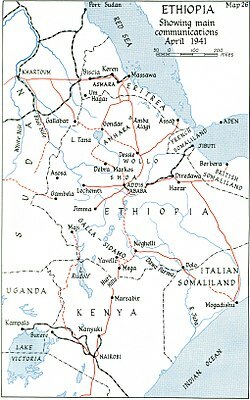 The route was served until 1935 by steam trains that took about 36 hours to do the total trip between the capital of Ethiopia and the port of Djibouti. Following the Italian conquest was obtained in 1938 the increase of speed for the trains with the introduction of four railcars high capacity "type 038" derived from the model Fiat ALn56. These diesel trains were able to reach 70 km/h and so the time travel was cut in half to just 18 hours: they were used until the mid 1960s. At the main stations there were some bus connections to the other cities of Italian Ethiopia not served by the railway. Additionally, near the Addis Ababa station was created a special unit against fire, that was the only one in all Africa. The architects of the Fascist regime had drafted grandiose urbanistic projects for the enlargement of Addis Ababa, in order to build a state-of-the-art capital of the Africa Orientale Italiana, but these architectural plans -like all the other developments- were stopped by World War II. Administrative subdivision of Italian East Africa. In 1939, there were 165,267 Italian citizens in the Italian East Africa, the majority of them concentrated around the main urban centres of Asmara, Addis Ababa and Mogadishu. The total population was estimated around 12.1 million, with a density of just over 6.9 inhabitants per square kilometre (18/sq mi). The distribution of population was, however, very uneven. Eritrea, with an area of 230,000 km2 (90,000 sq mi), had a population estimated in about 1.5 million, with a population density of 6.4/km2 (16.7/sq mi); Ethiopia with an area of 790,000 km2 (305,000 sq mi) and a population of some 9.5 million, had a resulting density of 12/km2 (31/sq mi); sparsely populated Italian Somaliland finally, with an area of 700,000 km2 (271,000 sq mi) and a population of just 1.1 million, had a very low density of 1.5/km2 (4/sq mi). In February 1937, following an assassination attempt on Italian East Africa's Viceroy, Marshal Rodolfo Graziani, Italian soldiers raided the famous Ethiopian monastery Debre Libanos, where the plotters had taken refuge, and executed the monks and nuns. :5 Afterwards, Italian soldiers destroyed native settlements in Addis Ababa, which resulted in 30,000 Ethiopians being killed and their homes left burned to the ground. :5 The massacre has come to be known as Yekatit 12. After the massacres, Graziani became known as "the Butcher of Ethiopia". He was subsequently removed by Mussolini and replaced by Prince Amedeo, Duke of Aosta, who followed a more conciliatory policy towards the natives, obtaining a limited success in pacifying Ethiopia. 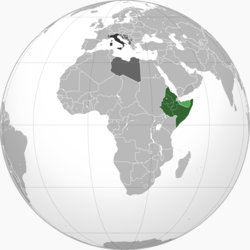 ^ The full title of viceroy was Viceroy and Governor-General of Italian East Africa. ^ Page, Melvin E; Sonnenburg, Penny M (2006). Colonialism: An International Social, Cultural and Political Encyclopedia. ABC-CLIO. p. 1054. ISBN 9781576077627. ^ a b c Istat (December 2010). "I censimenti nell'Italia unita I censimenti nell'Italia unita Le fonti di stato della popolazione tra il XIX e il XXI secolo ISTITUTO NAZIONALE DI STATISTICA SOCIETÀ ITALIANA DI DEMOGRAFIA STORICA Le fonti di stato della popolazione tra il XIX e il XXI secolo" (PDF). Annali di Statistica. XII. 2: 263. Archived from the original (PDF) on 3 August 2014. Retrieved 24 December 2013. ^ "Italian East Africa". World Statesmen. Retrieved 9 November 2015. ^ Ofcansky and LaVerle Berry, Thomas P. "Ethiopia in World War II". A Country Study: Ethiopia. Library of Congress. Retrieved 11 January 2014. ^ a b Fuller, Mia (2016). Ben-Ghiat, Ruth, ed. Italian Colonialism. Palgrave Macmillan US. ISBN 9781403981585. ^ Clapham, Christopher (1984). "The Horn of Africa". In Crowder, Michael. The Cambridge history of Africa. Vol. 8, From c. 1940 to c. 1975. Crowder, Michael, 1934-1988. Cambridge: Cambridge University Press. p. 460. ISBN 9781139054621. OCLC 317592773. ^ a b c Kallis, Aristotle A (2000). Fascist Ideology: Territory and Expansionism in Italy and Germany, 1922-1945. London: Routledge. p. 124. ISBN 9780203170373. ^ "Ethiopia 1935–36". icrc.org. 8 January 2008. Archived from the original on 1 December 2006. ^ Baer, George W. (2013). Coming of the Italian-Ethiopian War. Harvard Univ Press. p. 279. ISBN 9780674280373. ^ Italian Foreign Policy in the Interwar Period, 1918–1940. Retrieved 24 May 2015. ^ a b c Playfair, Ian Stanley Ord; Molony, Chartres James Chatterton; Stitt, George Marquis Stewart; Toomer, Sydney Edward (1954). The Mediterranean and Middle East. ^ Zolberg, Aristide R; Aguayo, Sergio; Suhrke, Astri (1992). Escape from Violence: Conflict and the Refugee Crisis in the Developing World. Oxford University Press. p. 106. ISBN 9780195079166. ^ a b c d e f g h i Cannistraro, Philip V (1982). Historical Dictionary of Fascist Italy. Greenwood. ISBN 9780313213175. ^ "1940 Article on the special road Addis Abeba-Assab and map (in Italian)" (PDF). Archived from the original (PDF) on 2012-04-02. Retrieved 2011-09-22. ^ ""Pompieri ad Addis Abeba" (in Italian)". Archived from the original on 2016-11-04. Retrieved 2018-12-20. ^ Royal Institute of International Affairs (24 August 1940). "Italian Possessions in Africa: II. Italian East Africa". Bulletin of International News. 17 (17): 1065–1074. ^ Sarti, Roland (1974). The Ax Within: Italian Fascism in Action. New Viewpoints. p. 191. ISBN 9780531063675. ^ Campbell, Ian (2007). ""Yekatit" 12 Revisited: New Light on the Strike Against Graziani". Journal of Ethiopian Studies. 40 (1/2): 135. ISSN 0304-2243. JSTOR 41988224. ^ Mockler, Anthony (1985). Haile Selassie's War: The Italian-Ethiopian Campaign, 1939-1941. Random House. ISBN 9780394542225. ^ Knox, MacGregor (2005). Mussolini Unleashed, 1939-1941: Politics and Strategy in Fascist Italy's Last War. ACLS History E-Book Project. p. 150.